A week after it accidently gave a sneak peek at its new photo and video sharing app, Facebook yesterday officially released Slingshot for iOS and Android in the US. The app lets you send photos or short duration (15 sec) videos to either an individual or a group. You can also send a shot to all your friends, a feature that Snapchat users have demanded for long. Like Snapchat, the content you share through Slingshot is ephemeral, which means that it disappears after it’s viewed, though you can auto-save what you create. The app also lets you add text right over the image or as a caption. But what truly differentiates the app from others is its reply-to-unlock feature that makes it mandatory for users to reply with a photo or video before they can unlock or see a photo or video sent by their friends. While some of us might perceive the feature as a needless hassle, Facebook sees it as a way to increase participation. "When everyone participates, there's less pressure, more creativity and even the little things in life can turn into awesome shared experiences", the Slingshot team said in a blog post. According to Slingshot designer Joey Flynn, the bigger idea is to turn every user into a creator that posts more than they might on Facebook. The app also lets you quickly react to a post with a selfie or text comment, and unlike regular photo and video shots, the reactions are always unlocked and ready to view. You can sign up for the service with your mobile number and connect with those in your contact list as well as with your Facebook friends. 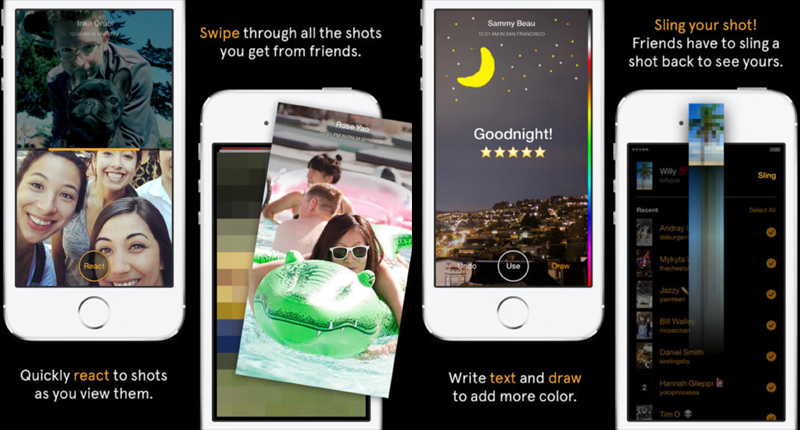 Slingshot is Facebook's second attempt at a Snapchat competitor, after Poke, a Snapchat clone that was created by a small team at the social network in just 12 days, failed to attract a significant number of users and was removed from the Apple App Store.